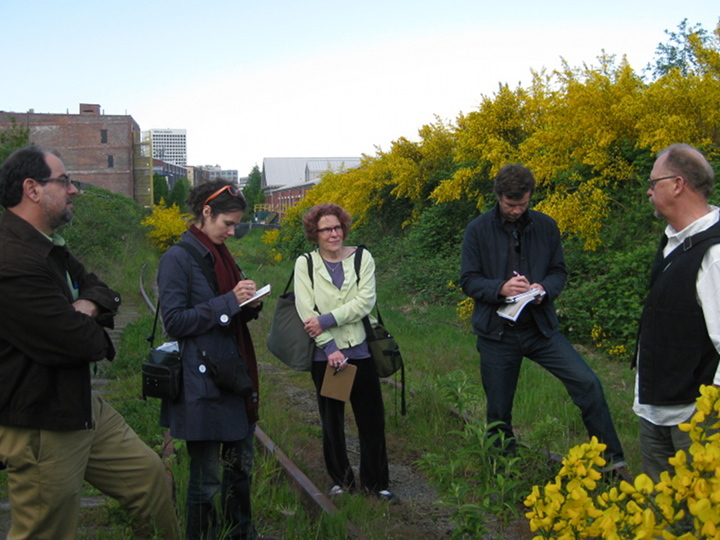 Urban planner Todd Bressi and the design team of Lucy Begg and Robert Gay (Thoughtbarn) held a lively series of speaking engagements in Tacoma last week, on the public art plan for the much-vaunted Prairie Line Trail (PLT). The trio met with staff from the City, University of Washington-Tacoma and Tacoma Art Museum; historic preservationists, downtown stakeholders, artists, cycling advocates and interested citizens about the trail’s potential to become a showcase for art and art experiences, as well as a magnet for civic activity. The design team was awarded a $30,000 commission, supported by a National Endowment for the Arts (NEA) planning grant, to develop an art proposal for the legacy trail which will link downtown Tacoma’s most significant cultural and historical sectors. Unbeknownst to most Tacomans, the Prairie Line Trail is an extraordinary landmark of Tacoma history. 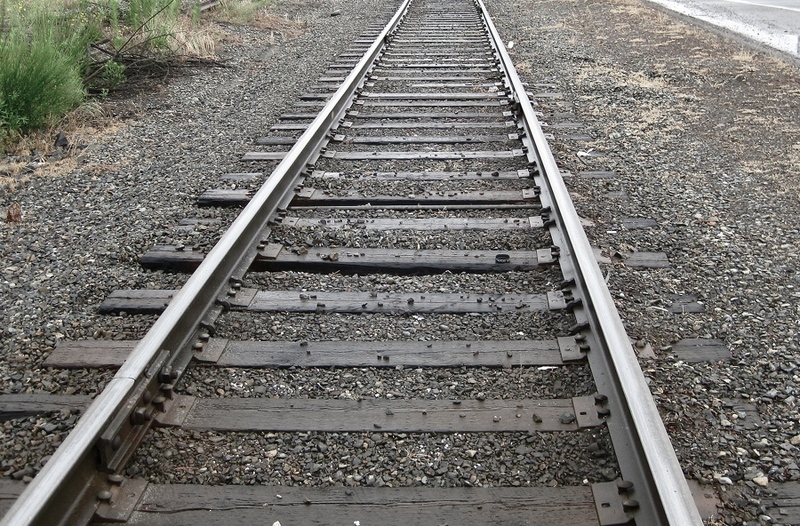 In 1873, the Northern Pacific Railroad designated the now-overgrown, half-mile, two-acre corridor as the western terminus for its transcontinental railroad, beating out competitors Seattle, Olympia and Bellingham. Modern city-building and telegraph communications followed the railroad, and from here sprung the town’s moniker, “The City of Destiny.” The proposed $5.83 million walking, biking and interpretive trail follows the historic rail corridor linking the University of Washington-Tacoma campus, the Brewery District, the Museum District and Thea Foss Waterway, and eventually connects with the Water Ditch Trail. Users will be within walking distance of the convention center, the copper-domed Union Station, and the ethereal Museum of Glass Bridge – all destinations that radiate outward from the Tacoma Art Museum (currently awaiting a streetscaping and plaza/entrance redesign). 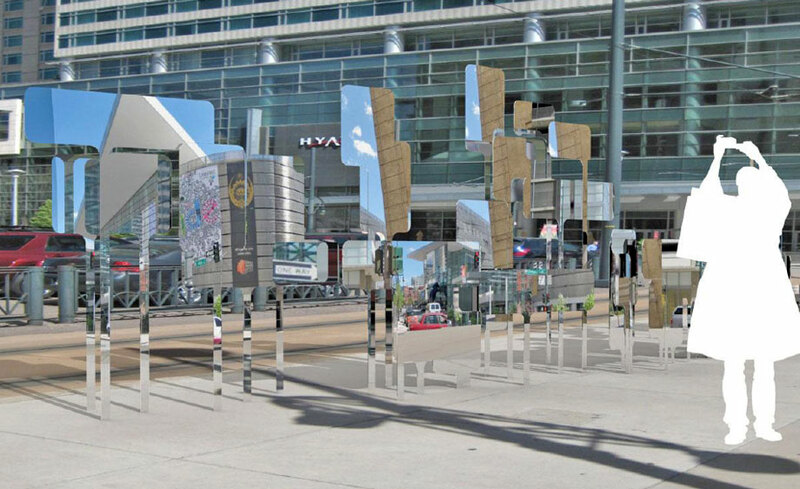 By commissioning a public art plan, “We are developing a roadmap that’s considerate of art” and honors the city’s history, says City Art Administrator, Amy McBride. That may be an understatement: The Prairie Line Trail offers a ripping opportunity to create a history-infused active destination and outdoor art venue that is unique to Washington, and the country. The PLT will draw visitors to our historic downtown, where curated temporary and site-specific permanent art may greet trail users. 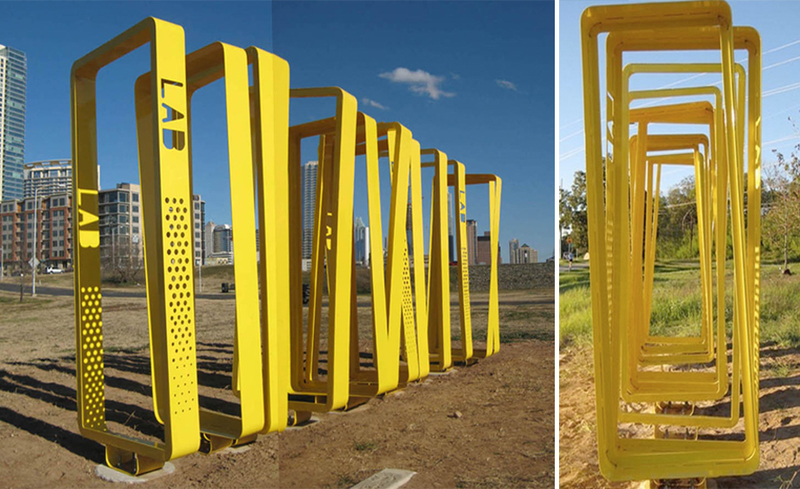 Thoughtbarn's iconic yellow wayfinding designs for the Lance Armstrong Bikeway (Austin). According to Bressi, the mission of the public art planning team (who were selected from a national field of candidates) is to help develop creative alliances between the City, the University of Washington and other private and public interests “that transcend jurisdictional boundaries,” and to enjoin public process in such a way that community aspirations find context. The team will identify aesthetic issues and community goals, and integrate design teams, but they will not design the trail or select participating artists. Bressi is an urban designer and planner who specializes in public art and cultural planning; he has taught public art, urban design and preservation classes at the University of Pennsylvania. His projects include the Legacy Trail in Lexington, KY, a 9-mile bikepath and interpretive trail from the inner city to horse country, with a “long-term goal [for] art to inhabit the landscape.” Gay and Begg are architects/artists; their multidisciplinary studio, Thoughtbarn, “champions the artful design of everyday spaces through buildings, urban strategies, public art installations, and furniture.” Thoughtbarn boasts outstanding creds in the area of bikeway projects: They co-designed (with Jack Sanders and Leah Davis) the solar-powered way-finding system for the Lance Armstrong Bikeway in their hometown of Austin, with inspiration gleaned from Armstrong’s bright yellow wristbands. Explaining how the group will work together, Bressi says they “expect to collaborate fully on developing the basic ideas behind the plan and the demonstration project [due in October]. I will be the lead in completing the plan. Robert and Lucy will be the lead in completing the art project.” The three have collaborated on projects before. PEEKS (Denver). Thoughtbarn and Todd Bressi. “The first thing that attracted me to this project actually was that I had visited this area before and saw qualities in it, and in the public art, that I wanted to capture in my work. “I came to Tacoma some years ago, as a consultant working with GSA on the courthouse at Union Station. I had a chance to walk around this area of Tacoma, and what left the strongest impression on me was the public art. First it was little things: unique artworks that define the Theatre District. The playfully colored maritime artifacts along the Thea Foss Waterway. The way that sculpture creates a link between the material of the landscape and the material of the architecture at the Union Station courthouse and the state history museum. Then, of course, the contrast between Chihuly’s modern glass work and the historic architecture. The artwork that creates such a remarkable passage over the train tracks and the highway to the Museum of Glass – the boldness of putting this on a bridge! “What’s interesting is that each of these groups of projects defines its place in a slightly different way. Cumulatively, they set the stage for an exploration of the city, a sequence of experiences. You know when you are moving from one place to another, like through rooms in a house. And as you move about the city, you realize you are interacting with the art in different ways. Sometimes it takes you by surprise. Sometimes it makes you smile. It lets you know where you are. And every once in awhile, it just takes your breath away. Not a bad standard for this project to live up to. “When I assemble a [project] team I try to think about the qualities of the place where I am working as well as how I am going to address the specifics of the assignment. Fortunately, I had a good sense of what this trail corridor was like, and the interesting thing about the assignment was the desire to create an artwork as part of the planning process, with a small budget and little time. I wanted to work with Thoughtbarn because they are facile with materials, fabrication and installation, and because we had worked on a corridor project before. I thought they could do work that would respond to the materiality of the place as well as its scale, and had the capability to conceive and build a project within the time and money constraints….